The Incredible World of Phoenix Tattoos in Bangkok! Of all the birds that can be inked on your body, few would argue that the Phoenix is the most famous – and maybe the most beautiful. The legendary phoenix looks great on both men’s and women’s bodies. There is such a dazzling range of designs and color schemes you can choose from, and it has become one of the most loved, most attractive and most respected of all tattoos. And we haven’t even mentioned the inspirational meanings that go with each and every phoenix tattoo. The History and Meanings of The Phoenix. The Phoenix is a mythological bird that recycles its own life. It is at the heart of transformation – symbolizing the emergence from the dark into the light – rising from the ashes of a beautiful fire, to signify rebirth and the renewal of life. In Greece, The ancient Greek historian, Herodotus wrote in the fifth century BC that the phoenix originated in Ethiopia and was a magnificent resplendent bird with an amazing multi-colored plumage. He tell us that the phoenix made its nest in Cypress trees, but instead of laying eggs, the bird generated incredible heat, which eventually set itself on fire. 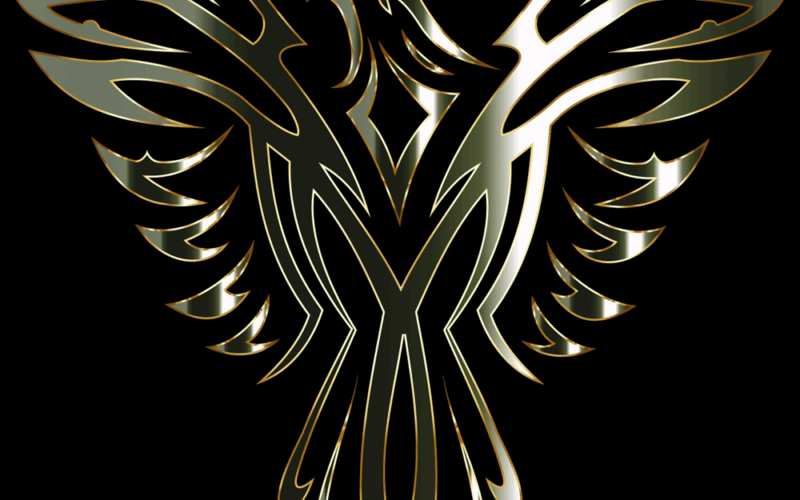 Three days later a new phoenix would emerge from the ashes, signifying rebirth, the cheating of death, and immortality. The Geek poet Hesiod in the 8th century BC stated in poetry that the Phoenix lived for 90,000 years. In ancient Egypt, their version of the phoenix was known as Bennu and was described as part heron, part falcon with feathers made of gold. The Bennu was closely connected with the Nile and the Sun. It flew into the sun at dawn to bring about the daily sunrise, and flew back again in the evening put it to bed at sundown. It was also believed to be the catalyst for the annual flooding of the Nile which was essential for the Nile valley agriculture to flourish. Egyptian alchemists used the Bennu in their rituals which concerned life, death, and renewal. They conjured up influences of fire, (transformation, purification, life, creation/creativity, consumption), southerly direction, (purity, renewal, strength, health), the sun, (cycle of life, clarity, illumination, immortality), and sulfur, (the soul, existence itself). In Chinese mythology, the phoenix is only second in importance to the dragon, signifying grace and virtue. It represents the union of the yin and the yang – symbols of balance, duality, and polarity. The female yin phoenix is related to femininity, goodness, virtue, kindness, intuition, the moon and winter; and the male yang phoenix is related to assertiveness, action, the sun, and summer. These twin phoenixes are emblems of a divine immortal partnership. The colors of the Chinese phoenix are usually black white, red, yellow and green. In Japanese culture, the phoenix is also closely related to the dragon and for men, it symbolizes strength and power. Like the Chinese it also represents the yin and yang, bringing into harmony both masculine and feminine virtues. It also is a symbol for the sun. In Rome, the phoenix symbolized the everlasting existence of the ancient Roman Empire and was featured on coins as a reminder of the indestructible nature of the empire which would last forever. Jewish legends maintain that the phoenix was the only creature that didn’t leave the Garden of Eden. It refused to eat the forbidden fruit, which made it immortal. Christians in the middle ages regarded the phoenix as a symbol of death and resurrection, similar to Jesus Christ’s death on the cross, resurrection, and immortality. Other Christians associate the bird with Mary, virginity, heaven and other facets of Christianity. Inspiration, fire (the sun, passion, energy), life cycle, magic, purity, clarity, rebirth, renewal, longevity, good health, wealth, victory of life over death, creativity, protection, immortality, resurrection, reemergence, transformation. While many people do not attribute specific meanings to their everyday tattoos, and generally choose them based on their aesthetic qualities, many make an exception when it comes to the phoenix. As stated above, there are a wealth of meanings to choose from, and by opting for a phoenix tattoo, you will have the opportunity to select a design that is particularly meaningful for you. Remember, it will be there for the rest of your life. You will have wide discretion and/or experimentation when choosing the design and color of your phoenix. Classic colors are red, orange, purple or yellow. A combination of all four of these colors is how the phoenix is described in many legends. Another popular and stunning color combination is the sun spectrum of golden yellow, fiery red and bright orange. You could also go for a completely modern interpretation that can be in your own unique color scheme. Sometimes, just a simple outline of the phoenix is created in a tattoo, which will portray a more understated and sensitive effect – popular with women. Women tend to love the beauty of certain phoenix designs and often have a great affinity with the concepts of long life and renewal. Your phoenix can be drawn “in flight”, or standing in a majestic pose, or maybe rising out of a fire; or indeed any other pose that you feel is right for you. You could also include your phoenix as part of a tribal tattoo, and use the same tribal colors for your phoenix. As far as body placement is concerned, a phoenix can be inked just about anywhere on your body and can be of any size. It can be a small delicate design on your arm or thigh, or if you wish to make your phoenix the centerpiece of your body art, then the chest and back are the obvious places to put it. But a phoenix will also look good on the arms or legs, thighs, shoulders – just about anywhere that your artist believes will work. Another useful thing to bear in mind is that a phoenix can often be worked in with other body art, such as tattoos of feathers, wings, or fire. If you have no idea of where to start with your phoenix tattoo; or what design and what color scheme you want, or even where to place it, then please do not hesitate to contact us at ALL DAY Tattoo in Bangkok. Our brilliant artists will be only too pleased to show you the hundreds of designs and colors available and make suggestions as to placement. But most of you will have already done your basic research and will have a rough idea of what you want and where to place it. So for those who have decided the “what and where’, the next step is to chat with an expert, such as on of our artists at ALL DAY Tattoo in Bangkok. Remember, at ALL DAY Tattoo in Bangkok, we do not charge for consultations, so you’ve got nothing to lose. We love our work, and we are only too happy to help and give advice to anyone who comes through our studio door, whether or not it leads to business. So why not click on the button below and make an obligation-free appointment to discuss your phoenix ideas with our friendly staff.